The At Random building has changed a lot over its long life span, but not so much in the past 55 years. Published March 4, 2019 at 9:02 a.m.
For the entire month of March, we're serving up fun articles on bars, clubs and beverages – including guides, the latest trends, bar reviews, the results of our Best of Bars poll and more. Grab a designated driver and dive in! If Ron and Shirley Zeller had to sell At Random – and let's be honest, they had to sell At Random; both are in their 80s – there was no more fitting buyer than John Dye. 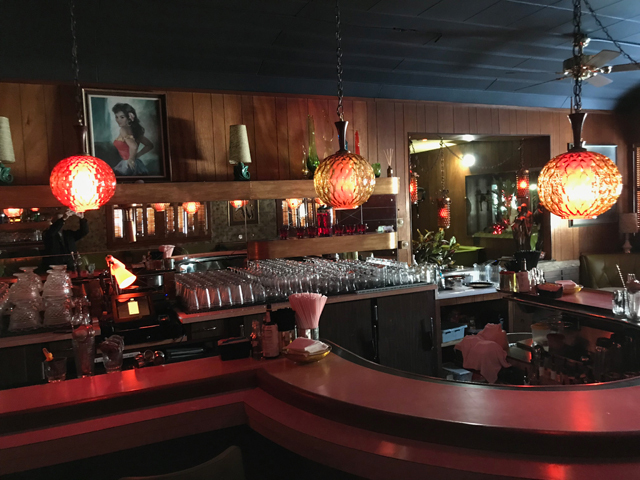 Dye, who has a passion for history and some serious cocktail skills, has maintained the equally legendary Bryant's Cocktail Lounge for a decade now, and more recently he revived and improved The Jazz Estate on the East Side. After closing briefly for a touch-up, Dye reopened At Random in early December. Dye is the guy that will give At Random, 2501 S. Delaware Ave., a deep clean, update its infrastructure and keep it as close to the same as is possible. Correction: John Dye is the guy that's already doing that. 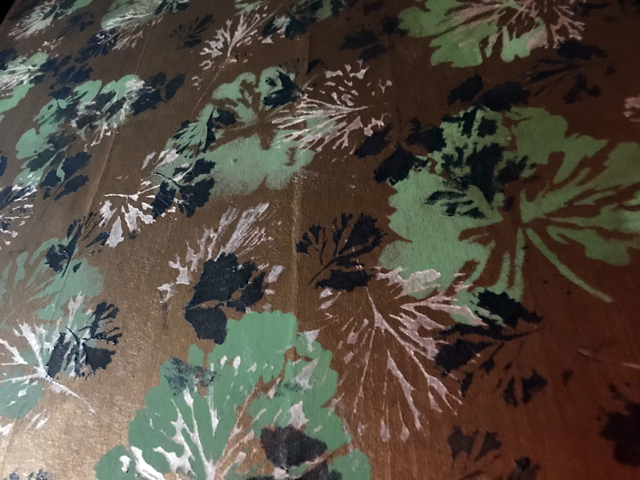 He's recovered the booths, which had suffered some wear and tear, and he hired a professional to come in and restore the vintage wallpaper (pictured above) by HAND PAINTING it. "I would say The Jazz Estate was the most work," says Dye when I ask him which of the three vintage businesses was the toughest to reopen. "It was such a tricky space and it just required so much manipulating. It was really, really hard. That was most challenging. "This one was actually a lot like Bryant's. 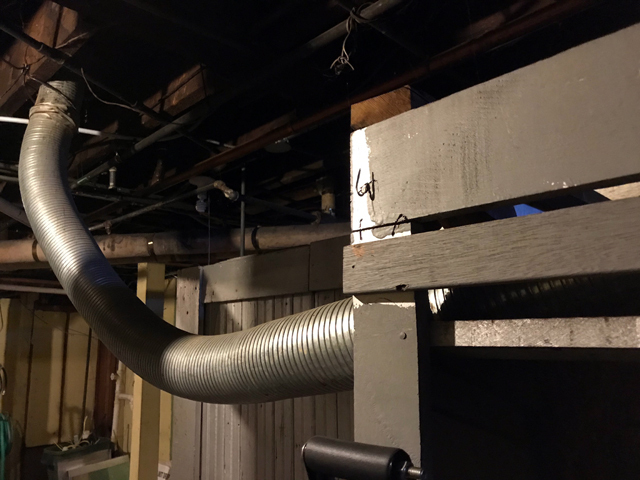 It had been well cared for over the years but the last couple decades, 'nah we don't need to put a roof on' ... 'no, we don't need to fix that leak; put some tar on it' ... that type of thing. "So there is water damage and stuff like that, but nothing really major. No structural stuff or anything like that. Which is really nice. I'm sure if we wanted to convert this to something else, there would be structural issues. But that's not who we are." Who "we" are is a guy that is passionate about history and as much a geek about nosing around as I am. He shows me the back porch that's hidden under the exterior siding now. In there you can see original clapboard exterior walls and windows that are now covered up and hidden from outside. He shows me the office, which was once clearly the kitchen of the saloonkeepers' apartment (now the back room of the lounge). To get there you have to pass through a narrow service bar that's hidden from customers' view. 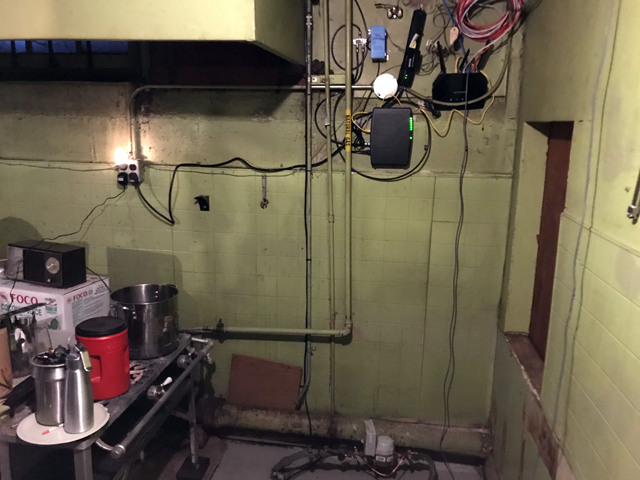 In the basement, Dye points out differences in joists, which suggest where additions were completed, as well as the kitchen (pictured below) that used to turn out a regular Friday fish fry. 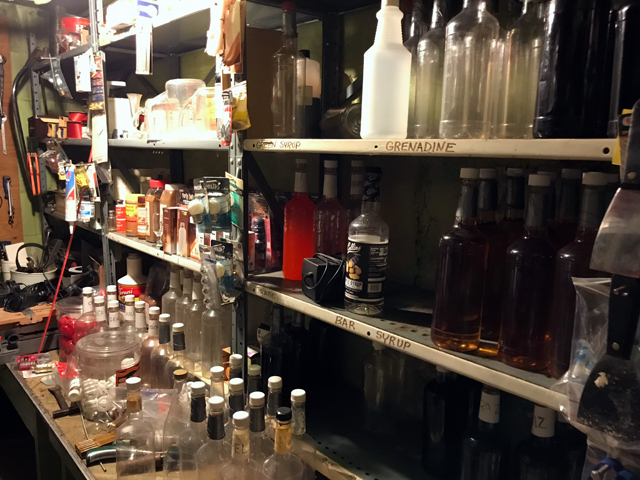 Nearby is the storage area that sort of resembles the laboratory of a mad cocktail professor. There's even a shelf marked "orgeat." 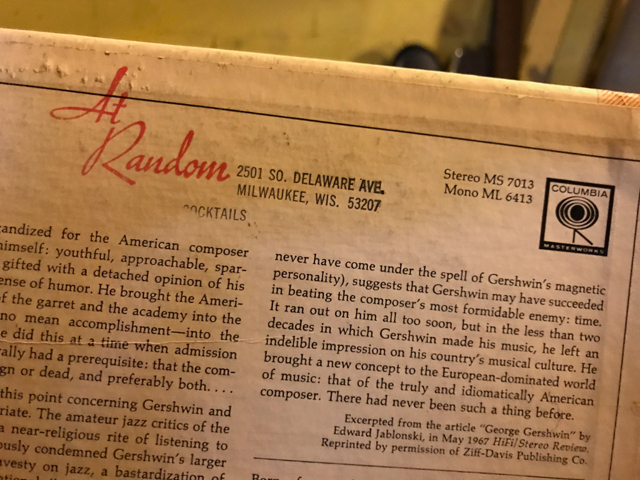 We also get to peek at the lounge's collection of vintage jazz and easy listening records, each stamped on the back with the At Random logo. He's basically keeping it all. 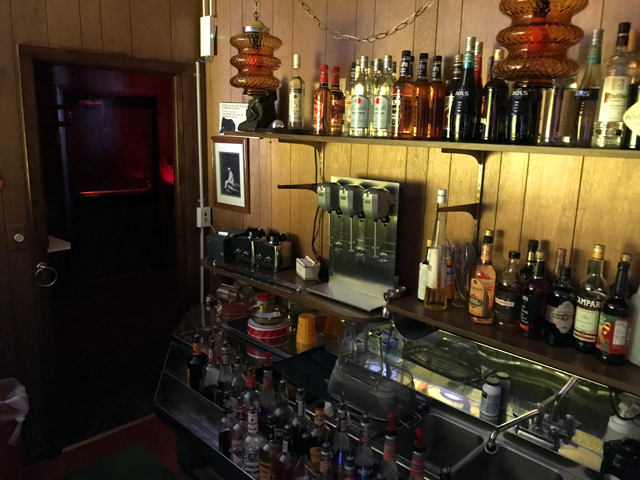 As hard as it may be to believe, given its rather unique 1960s lounge appearance, At Random actually occupies what was built first as a cottage – that's the back room – in 1884, with a tavern/store added to the east – the room in which the bar is still located – in 1893. The 1894 Sanborn Fire Insurance Map. 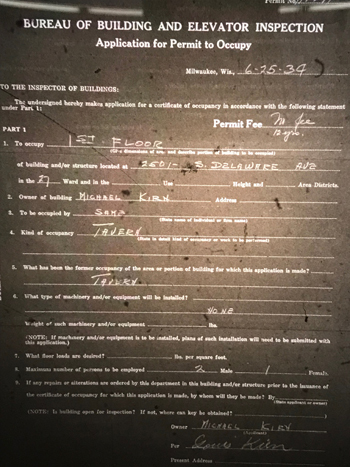 At the time the tavern was added, either Gottleib Patek, a well-known grocer and early Milwaukee settler, who had his store a block north on Delaware (then called Ellen Street), or his son George, – a paint and glass dealer – owned the property, for it was in the name "G. Patek" that the permit was pulled in 1893 for the addition, which was built by Mitsch Bros. contractors. The small commercial wing, which was expected to cost a whopping $700, seems like a bargain even in today's dollars ($19,500). An early photo of the building – taken sometime between about 1909 and 1917 – shows a frame tavern with a recessed corner entrance, three windows facing Russell Avenue and a faux gable above. A few more windows, and a service door, dot the Ellen Street facade. Just peeking in on the right side of the image is the saloonkeeper's cottage, where you now enjoy your Tiki Love Bowls. Lorenzo M. Spencer appears to have been the first to tie on an apron behind the bar in the building, with records showing him there from 1884. Spencer's wife died in January 1896 and it seems that not long after he left the business and the building ceased to be a tavern for a time. 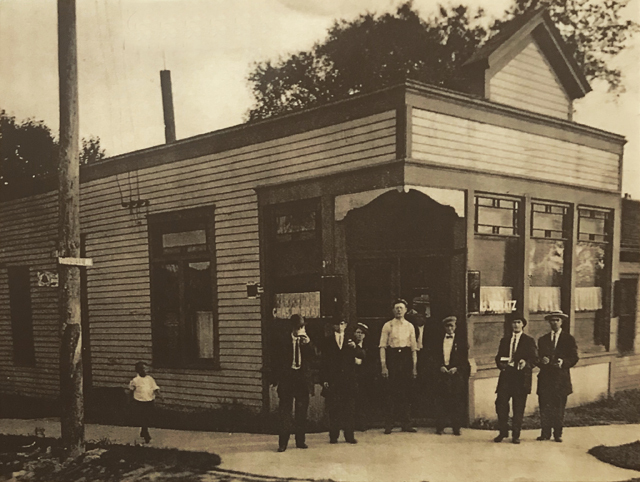 Bernard D. de Hosson, who received his state board of pharmacy license in early 1895, first set up shop the following year over on Wentworth (then called Bishop), buying an existing drug store from Louis Schildknecht. By 1898, records show he was operating the same business in what is now At Random. 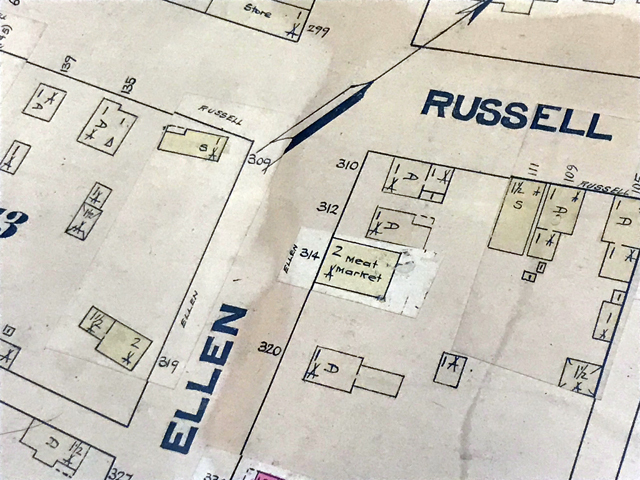 In 1900, city directories show Spencer running a tavern on 2nd and Virginia and de Hosson still dispensing cures on Russell and Ellen, but not for long. By the following year, documents show pharmacist A.W. Biebensheimer in the space and de Hosson operating in a building that still stands at 1227 W. Juneau Ave.
Later, de Hosson would briefly return to Bay View, running a drug store in what is now home to Hi-Fi Cafe on KK, before relocating to Green Lake, where he took over a pioneer-era pharmacy so long-lived that it had already become legendary to townsfolk as the "drug store across from the village pump" a century ago. 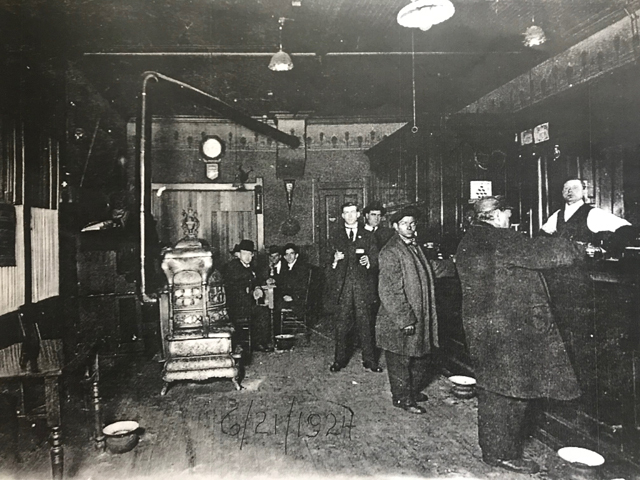 Back at Russell and Ellen, Biebensheimer moved to a new space a block south (at 2601 S. Delaware, now a residence) around 1903-04 and the future At Random returned to duty as a beer hall, this time under the eye of barkeep William J. Schweishelm, who stayed on here with his wife Mamie until 1909, when they took over a saloon on Bay Street. Schweishelm continued to run that tavern (now long-since razed) until his death, at age 56, in 1934. Replacing him at the Russell and Ellen place was Charles Dobratz, son of an eponymous cooper that had come to Milwaukee from Germany in the 1870. 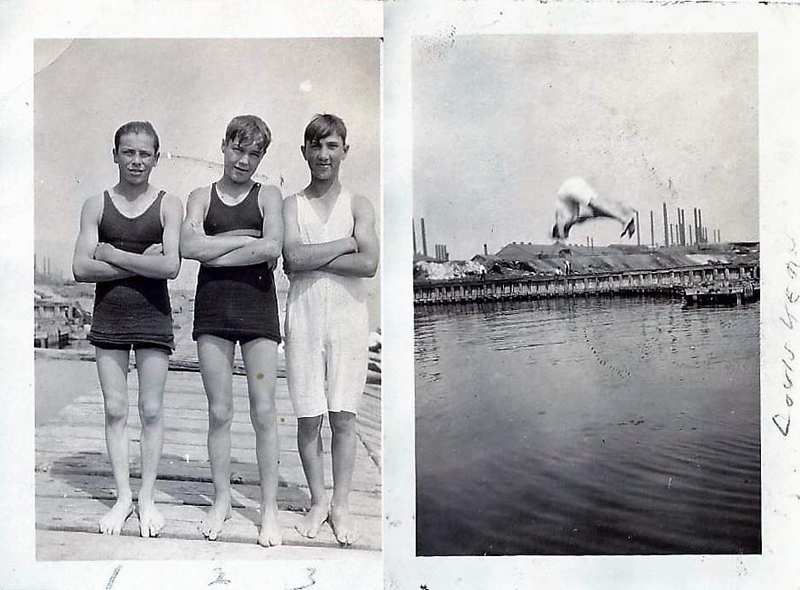 The younger Dobratz had been working at the Moore Manufacturing Co. (a foundry and bicycle manufacturer) in South Milwaukee when in 1896 he had his leg crushed while he was "leaving a moving train" in Cudahy. Though he appears to have continued at Moore (whose cycleworks survived the financial woes of its foundry arm, reorganizing in 1897) at least until the dawn of the new century, Dobratz's injury could have severely limited his ability to do factory work, which may have led him to the saloon game. Photos taken during the Dobratz era show a simple space. A bar is on the right, where the At Random bar also stands and what appear to be toilets, again in the same spot. 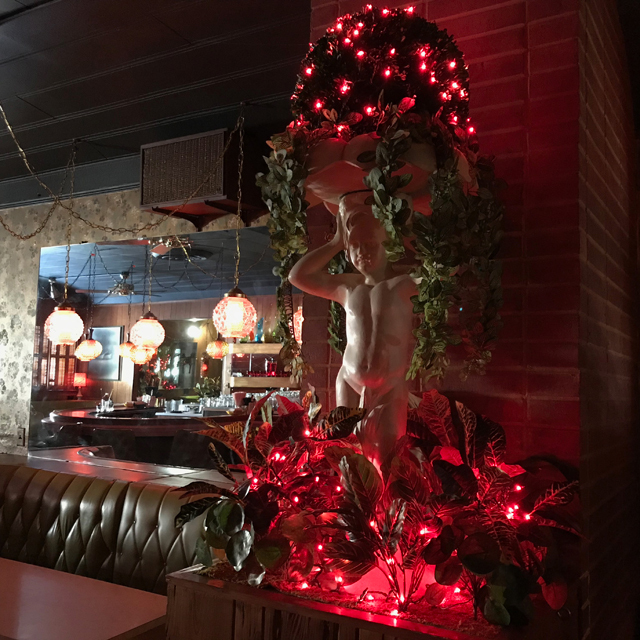 A few lights hang from the ceiling, illuminating a group of men at a table near a big cast iron heating stove and Dobratz posing regally behind the bar, ready to serve a few other men standing on the opposite side of the wood, spittoons at the ready on the hardwood near their feet. A piano is tucked away in the far corner and a clock hangs on the wall, but there is little other decor. 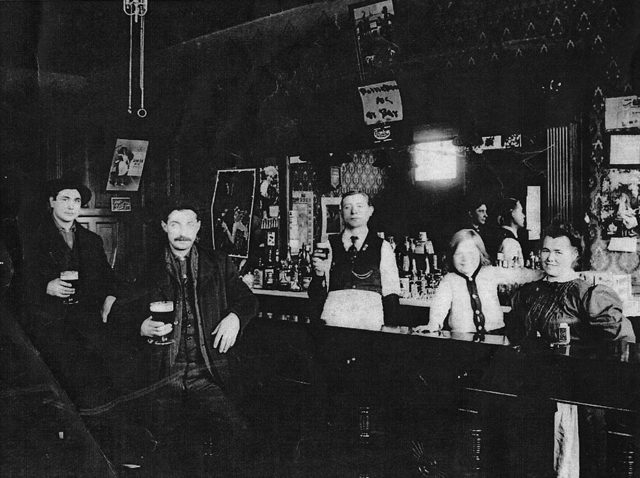 Another shot, with a smiling woman and child joining the stone-faced Dobratz behind the bar shows a few advertisements and images on the wall near back bar. In 1918, the name Michael Kirn – who had been born in Trieste, Italy – first appears next to the tavern's address in a city directory. It's a name that would remain attached to the place for many years to come. 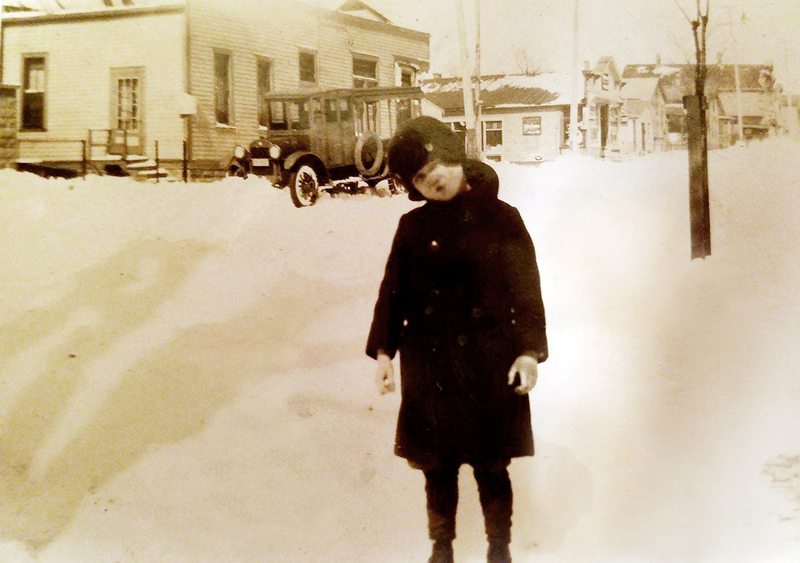 Kirn arrived behind the bar not long before Prohibition was passed in 1919 and became law the following year. But it doesn't appear to have slowed his business at what was now officially a "soft drink parlor." left photo and is diving in the photo at right. In 1922, he added a masonry barn, which was later razed, though a portion of it remains, according to Dye. I couldn't see it when I visited because the site was blanketed with snow and ice. Eight years later, Kirn found himself shackled when the feds walked in on him In flagrante delicto. "Brew Brings Run of Luck; But All Bad. Jury Fails to Believe Beer Not Allowed in Drink Place," read the headlines on a brief newspaper article in May 1930. "Michael Kern (sic), operators of a soft drink parlor and restaurant at 309 Delaware Avenue, is an unlucky man. The first time that luck played a dirty trick of Mr. Kern was several months ago when federal prohibition agents walked into his place and found him making beer. The next bad break was Friday when a federal jury heard Mr. Kern say that he had run the place for 14 years without violating the law, but had gone into the basement the day of the raid to make a little beer for his sister-in-law's party. He never permitted it in his saloon, he said. The bad break came when the jury failed to believe the story and found him guilty of maintaining a nuisance. The third bit of bad luck was when Mr. Kern appeared before Federal Judge F.A. Geiger for sentence. He was sent to the house of correction for six months and fined $200." But it wasn't all bad news for the Kirn family during this era. In fact, if dad was something of a goat at the moment, his son Louis was on the road to heroism. After graduating from Boys' Tech High School and attending the Peddie Boarding School in Highstown, New Jersey, Lou, who had proved a man of distinction on the gridiron, was appointed to the U.S. Naval Academy in Annapolis, Maryland – along with South Division grad Anthony Dropp – by Congressman John C. Shafer. Soon enough, donning a Navy football uniform, Lou often made headlines on the sports pages back home. A view of the tavern from the southeast, circa late 1920s-early '30s. In December 1929, the Sentinel, in an article about how Kirn lifted Navy to victory over Dartmouth, wrote, "besides pa and ma, there are two sisters, Betty and Tillie. For 13 years the (Kirn) family had lived at 309 Delaware Avenue and about a year ago moved to Cudahy. Lou graduated from Immaculate Conception about 10 years ago and later attended Technical High School, where he played football. Four years ago he went to Highstown N.J., where he was a regular on the Peddie 11." The following year, the younger Kirn – by then nicknamed Bullet Lou for his speed as a fullback on the turf – earned his varsity N in football at the Naval Academy and in 1932, he took his final exam at the academy. Soon after, Michael Kirn's place was once again legally selling booze and in 1937 the elder Kirn expanded the cottage part of the building and, in '39, put siding on the bar's exterior. At this point, it appears Bullet Lou had returned home, at least for a bit, and was tending bar, surely delighting customers with stories of gridiron glory. But when war came, Lou was off like a shot, leading a squadron during World War II and returning to the daily papers here. 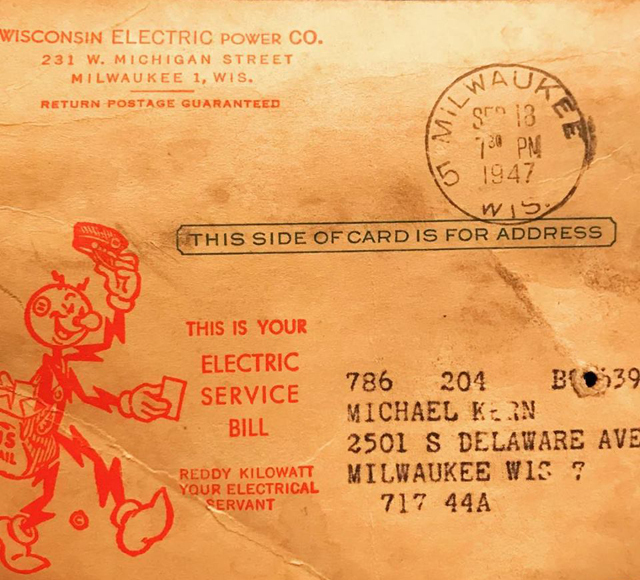 September 1942: "Word received in Milwaukee Tuesday that Lt. Com. Louis J. Kirn, son of Mr. and Mrs. Michael Kirn, 2501 S. Delaware Ave., was one of the squadron leaders who took part in the air battle against the Japanese at Solomon Islands on Aug. 24. Navy pilots, marine and army fliers and anti-aircraft fire all took their toll in the battle, in which 96 enemy planes were shot down over Guadalcanal Island and at sea. "Commander Kirn led his men in an attack on four Japanese planes. An outstanding student and fullback on Navy's football team, Commander Kirn had been in naval aviation since his graduation from the academy in Annapolis in 1932. He also played football for four years at Boys Technical High School here." And in December that year: "Navy revealed that the dive bomber squadron led by Louis J. (Bullet Lou) Kirn, 34, had attacked 88 Japanese warships and six transports, sinking or damaging 18 of them, in five weeks of operations from Guadalcanal airfield. He returned to duty last week after a 30-day furlough in which he visited his parents here. Only two of the 21 pilots in the squadron are missing. Four rear gunners are also listed as missing." In February 1943, Bullet Lou earned the Distinguished Flying Cross, which the Department of Defense notes, is awarded for "heroism or extraordinary achievement while participating in an aerial flight." He also earned the Bronze Star and the Distinguished Service Medal. With the war over, life appears to have returned to normal at Kirn's tavern and that December, Mike rented space on his corner lot to Erich Jochem, who sold Christmas trees there to festive Bay Viewers. But the Kirn era was winding down and after relocating the bathrooms and dropping the ceiling in the tavern in 1948, and installing a refrigeration system the following year, Kirn got out of the tavern business, listing the bar for sale with the simple words: "bar, used, modern, 20-ft. front and 20-ft. Back. Stainless steel work boards and tap box." Bullet Lou, meanwhile, struggled with health issues when, according to a 1995 obituary in the Miami Herald, "A rare form of encephalitis paralyzed Kirn in 1954. The illness almost ended his Navy career. After 27 months in Bethesda Naval Hospital, Kirn learned to walk and use his muscles again. In 1957, the Telephone Hour (sic) television show featured his successful fight against the crippling disease." After his recovery, Kirn went back to the Navy. He spent a year at the Imperial Defense College in London and commanded the Key West Forces and Naval Base during the Cuban revolution before retiring in 1970. Later, Kirn served as a defense attache at the U.S. Embassy in London and then moved to Florida where he worked as executive secretary for the Episcopal Diocese of Southeast Florida, retiring to Coral Gables in 1977. He died in November 1995 at the age of 87. 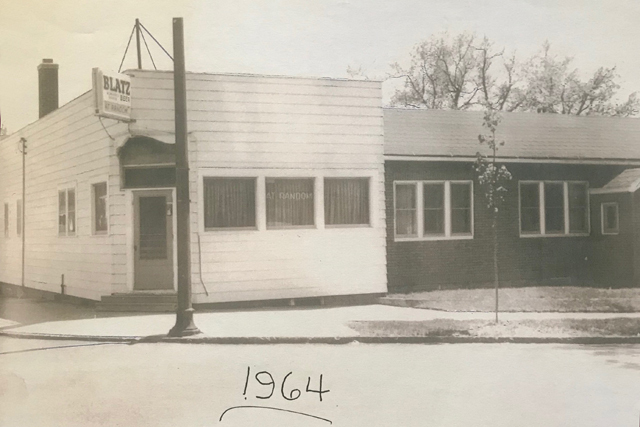 It appears that Mike Kirn ultimately kept the place in the family a bit longer, as from later in 1949, and into 1954, his son-in-law Ray Klug (who had married Tillie) ran the tavern, before selling to William Buss. Buss stayed on for a decade, replacing the windows and frames and slapping on aluminum siding during that era. 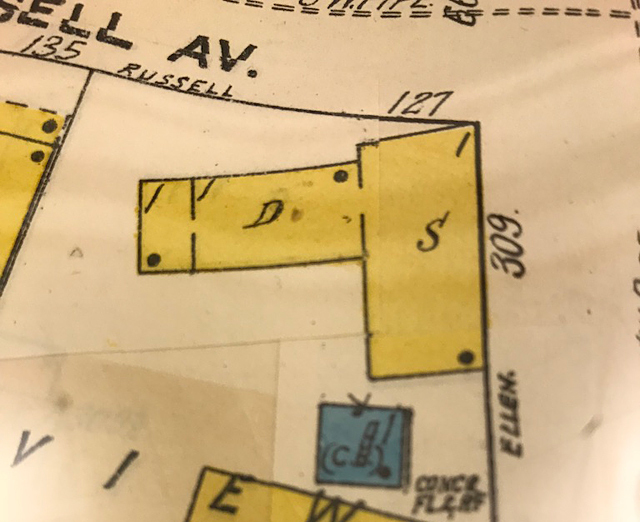 During his era, Buss named the place the Delaware Tap – and also, apparently, Bill & Mary's for a time – reflecting the new name of the street outside, which had been changed around 1930, when the city altered the address numbering system and a number of street names. After a false start trying to sell the business so he could retire in 1963 and finding himself among a group of people swindled by a con man who tricked sellers into paying commissions before their properties were actually sold, Buss finally handed the business over to Ron Zeller in January 1964. 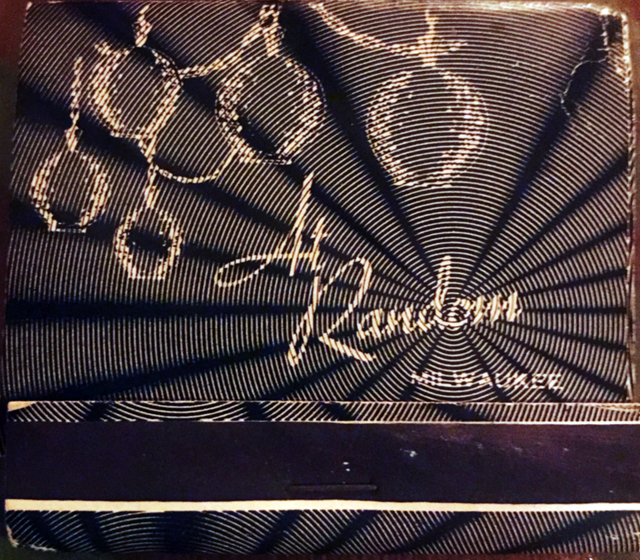 Most readers who have been to At Random over the years will have met Ron and his wife Shirley, who were the inimitable owners for decades, creating a place that has become part of the fabric not only of Bay View but of Milwaukee. 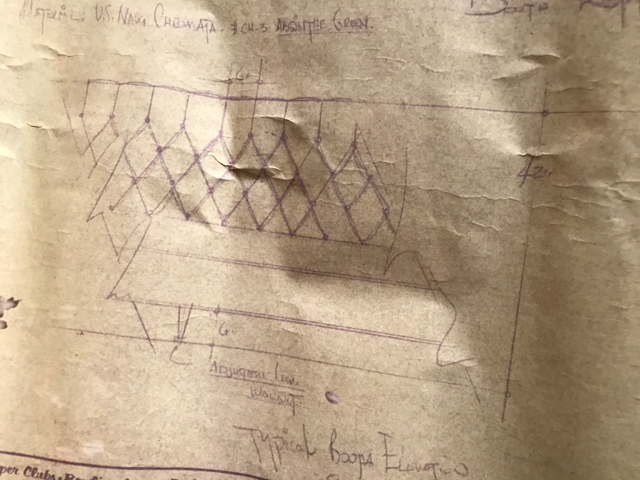 Blueprints for the 1968 transformation into the At Random you know and love. 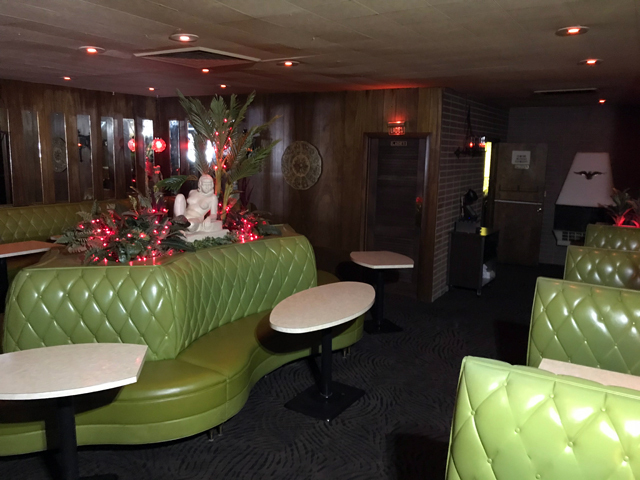 The booths were, appropriately, "absinthe green." 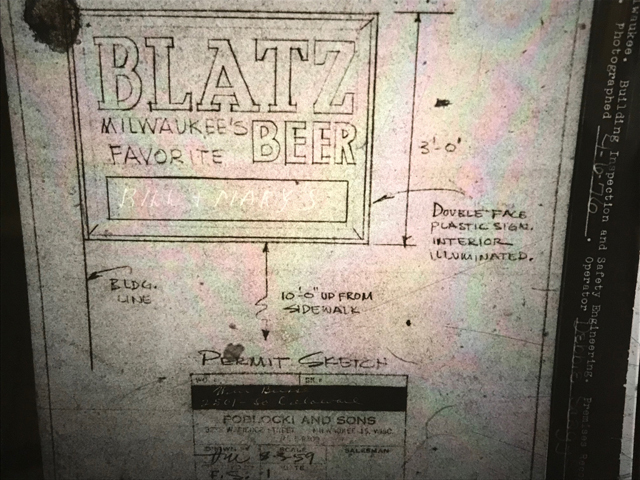 During their tenure, the Zellers renamed the bar At Random (pretty much right away), created the one-of-a-kind lounge decor, turned the cottage into the back room you see today (in 1968) and concocted the unique notebook menu of drinks that have become Milwaukee classics. 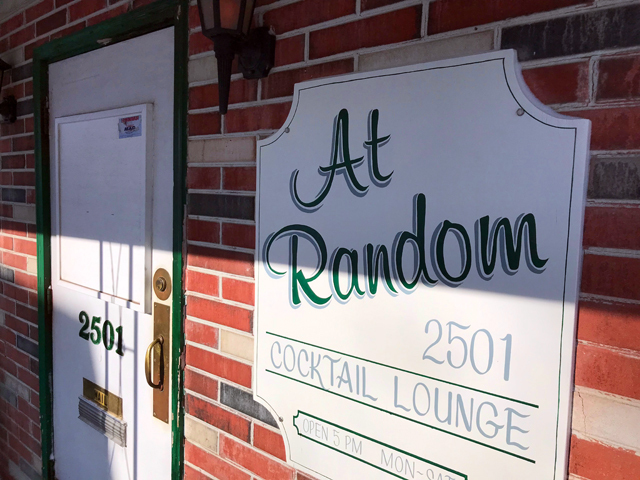 With its mix of classic cocktails and vast array of alluring ice cream drinks, the evocative and dimly lit At Random became the place to go on a first date, or an anniversary or just in search of a memorable night out. And, comfortingly, it seemed to never change. What did change was often so subtle that few tended to notice. It's been no secret that the Zellers have wanted to sell in recent years, but thankfully, a rumored deal a few years ago that would've razed the bar in favor of a new development never happened, and now, as I said, it's hard to imagine a more suitable owner than Dye, with his passion for classic places like At Random, as well as his interest in history. 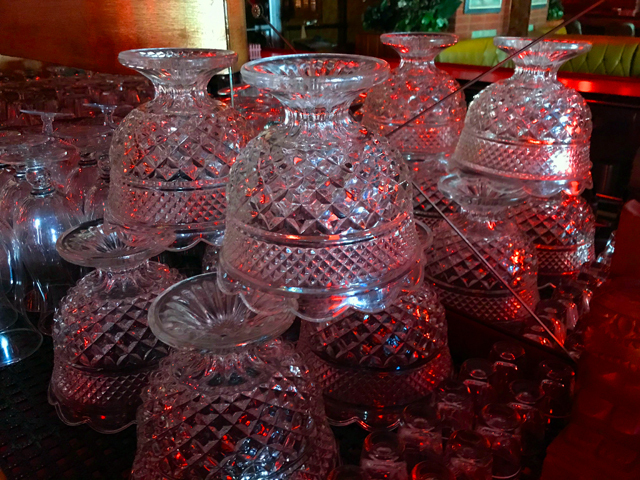 He does rue the fact that some objects have been lost, noting that the Zellers sold off much of the original glassware a few years ago. "They had a picker come in," Dye laments, "so now it's probably all in Oklahoma City or someplace." 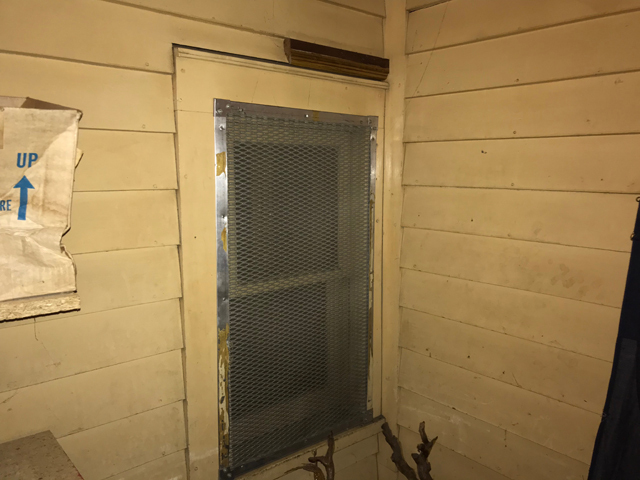 The old bottle chute isn't used anymore, but it's staying in place. But the clown paintings are still in place (what IS going on in that one right next to the door?! ), the horse photos still hang in the men's room, the classic light fixtures still illuminate the bar (even if just barely). "I try to run it as close as possible, but I don't run it the exact same way, because I'm an individual, too, and I have my own things," Dye says. "Their son Randy (Zeller) actually works here one day a week now, which is really nice." Ron and Shirley have not been back in for a visit since the sale, but that's OK, says Dye. "I told them just 'take it easy. I'm not going to bug you. I'm just going to let you have your retirement right now.' I'll reach out to again coming up, just to make sure that they're OK. For now, I'm there for them in any way. I shovel their walk and stuff like that. "They're right next door, too, so that's the thing. It's not that it's out of sight, out of mind. (At Random) is literally right next door to their house." "A lot of people when I bought it were like, 'well, is the staff going to be there?' No, they're retiring. 'But the staff was part of the charm.' Yes, but they are also humans and they deserve to be able to retire." Maintaining the traditions built over time in a place are clearly not a struggle for Dye, who has done it so well at Bryant's. The hardest part may be entrusting that work to others. "Everything is really good," Dye says. "We have a great staff and that's the key. We're still trying to figure the system out because I ran one place, originally. "I think that's the hardest thing for small business owners when they grow. It's just to let go of the little details, because you get to where you are because of the details. Then all of a sudden you're also supposed to ignore them." Vintage photographs courtesy of John Dye.